Vital, or metrical records are the core of genealogical research. 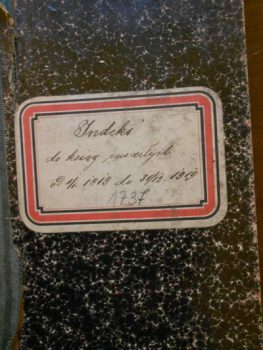 These Jewish birth, death, marriage and divorce records for Galicia can be found in a variety of archives in different locations, even for a single town. Many such records have not survived the events of the 19th and first half of the 20th centuries. The proportion that has survived varies greatly for any given town. 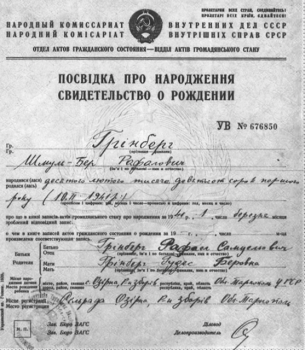 Birth certificate of Schmul Ber Grinberg, Jezierna, February 1940. The following town projects are in the 2019 Vital Records Project. The following town projects were in the 2017 and 2018 Vital Records Project. Support for the Vital Records Project, as for other Gesher Galicia projects, is always much appreciated. Donations will help to cover the costs of acquiring the images and indexing the vital records, as well as uploading the indexes onto the All Galicia Database, where they will be accessible for all to search. Once completed, the spreadsheets containing the indexes and the scans of the records will be available—for Gesher Galicia members—in the Members Portal of the Gesher Galicia website. You may donate to support the Vital Records project overall or else to a specific town within the project chosen from the list for 2019 above (for example, “VR 2019, Nowy Targ”). As always, we cannot guarantee in advance whether an original record set will be complete or whether it will contain information of interest to a particular donor. Donations by credit card or PayPal may be made online, through the Gesher Galicia website, by clicking here.